Can easily rip protected DVDs to Chromecast supported formats. Do you like to stream content from the internet into your HDTV? With Google Chromecast, the USB-like connecting device that runs a simplified version of Chrome operating system, you can directly plug into the HDMI port on the back of the television to stream DVD to HDTV. The total multimedia solution to rip DVD and stream DVD to Chromecast, TV, Android phones, iPhone, iPad, and so on. With the advanced encryption technology, it can remove any DVD copy protection at one go. For those who want to enjoy DVDs on HDTV, you can try Chromecast. It was recommended by critics, who spoke highly of its simplicity and potential for future app support. In addition, researchers in Google announced that users can send audio and video media from the Chrome browser to a television for viewing or listening. That is, Chromecast can transmit all the content on the network to a HDTV. It brings us a new way of watching HDTV. You do not have to switch on a computer to play web videos, or find out HDMI cable to connect your computer and HDTV. Whatever you want to watch on HDTV, just press a button, it delegates that task to the television screen, with no need for remote control. 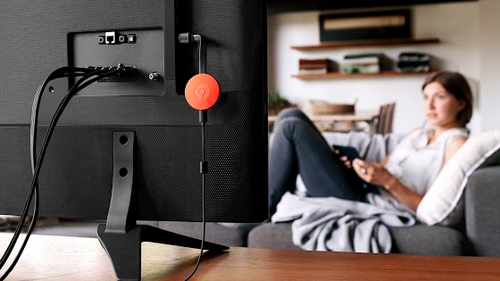 With Chromecast, your mobile device is your personalized remote control. Google Chromecast is the easiest way to enjoy online video and music on your HDTV. Similarly, DVD can also be played on HDTV via Google Chromecast 2 or Chromecast. But one thing you must take into consideration before you stream DVD to Chromecast 2 or Chromecast. Namely, you need to convert DVD to a format that is compatible with Chromecast. 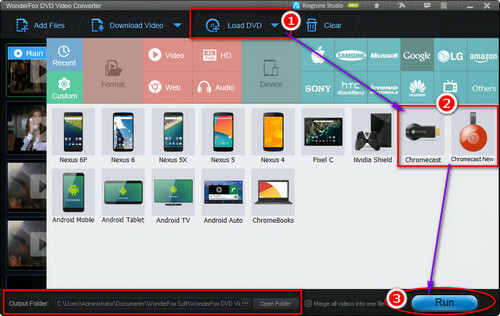 In this case, you need a professional Chromecast video converter/ ripper to encrypt DVDs. Preparation: Free download this program first. 1. You need to insert a DVD to DVD-ROM before you launch this software. Then press “Load DVD” on the menu bar to add your DVD disc. It will automatically recognize the main movie with no need to make a choice from a mount of titles. 2. Next, head to the “Output Format”. In the device part, click “Google”, then choose one Chromecast as output format. Besides, you are also allowed to output DVD to other Chromecast supported formats, such as MP4 and WebM (WebM has been seen as the best Chromecast video format) on the “Format” part. 3. Click the big blue “Run” to start to rip DVD to video in Google Chromecast format. After the quick ripping, click "Open Folder" to quick locate the converted DVD video. After ripping DVD to a digital video file, use Chromecast 2 to stream and cast DVD to Chromecast with the help of Google Cast button in Chrome browser. 4. Enter the digital file you convert from DVD to the address bar in Chrome or press Ctrl + O to import the video file or drag it to Chrome browser. 5. 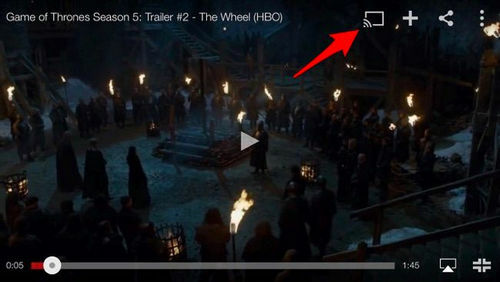 When the DVD video is played in Chrome browser, click the cast button in the toolbar on your browser in Chrome and choose the Chromecast 2 device. Then the DVD video will be streamed to TV via Chromecast 2 instantly. The whole process of DVD to Chromecast 2 and DVD to Chromecast ends. No matter it is to stream DVD Chromecast, Chromecast DVD from pc, or play DVD through chrome, all can be done with the above Google Chromecast tips. 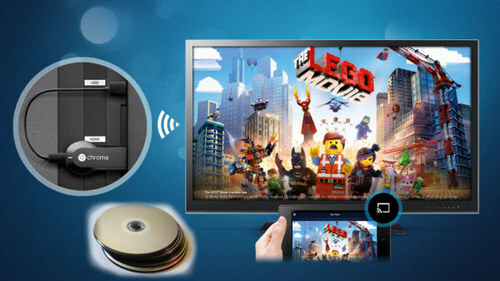 Now you can enjoy the DVD video on the big screen instead of the small screen after you convert DVD to digital file. Similarly, you can also cast music, photos, and online videos or cast 4K DVD with Chromecast to your HDTV. Beside DVD ripping, this program is also a professional video converter and online YouTube video downloader. 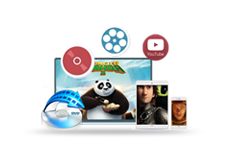 It can convert videos to 300+ formats and devices, for instance, DVD to tablet, DVD to iMovie, DVD to USB and so forth. Make DVD to digital: dvd rip, dvd backup, remove copy-protections, remove region lock. Video conversion: solving format/device compatibility issues and making vivid picture quality. Up to 300+ formats and hot devices supported. Video clip, crop and more useful edit features.